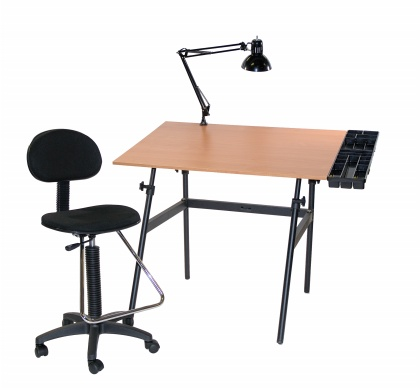 Berkeley 4-pc Combo Lamp and Drafting Chair. Home > Drawing Supplies | Drafting Tables | Berkeley 4-pc Combo Black w/ Cherrywood Top, Tray Lamp and Drafting Ht. Chair. Get to work immediately and productively with this attractive and functional combo at a stunningly affordable price. This Berkeley four-piece combination offering in black with a cherrywood working surface includes the folding table base, tray, lamp and drafting height chair. This is a complete package at a price that simply can’t be beat. The popular chair comes on casters and is hand-adjustable. Everything needed for the student, draftsman or artist is provided at a single cost below what one might expect for the chair alone. The black baked enamel finish and legendary folding table base are designed to provide years of dependable use. The table top measures 30” by 42” and is easily cleaned. Outfit classrooms or office areas with these combination units designed and constructed by the respected manufacturer Berkeley. The items are sent as flat packs to save on shipping and require assembly using basic tools. Add $45.00 for oversize shipping costs.